Put the fish in a pan with the vegetable broth or enough cold water to cover it fully. If you use the water add bay leaves, celery stems and salt and bring the water to simmer at medium heat. When small bubbles start, reduce the heat to low and barely simmer the fish for 20 min. Heat the butter or olive oil in a thick bottom pan, add the onion and cook for a couple of minutes till the onion turns glassy. Add the rice to the onions and stir until rice heats up. Splash in the wine and let it evaporate fully. Add hot broth to the rice ladle by ladle, letting the liquid evaporate before adding the next ladle. Cut off the top „flowery“ ends of the asparagus and cut the stems into 1-2cm long pieces. When the rice has become softer but is still very al dente (after 10min) add the asparagus stems to the pan and add more broth to finish the risotto. In the meanwhile cook the top ends of the asparagus in a little butter in a separate pan and let them get a slight brown „crust“. Keep separately. 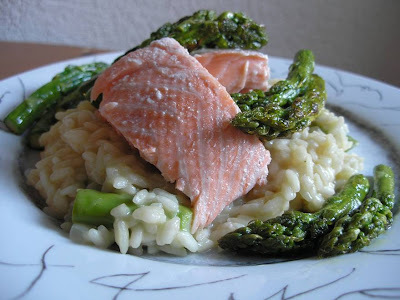 Finish the risotto when the rice is softer with still al dente bite and the asparagus is cooked but still crunchy by vigorously whisking in the parmesan and cold butter cubes with a wooden spoon. Leave the parmesan out if you don´t like the cheese with the fish, but do add the butter at the end.